Institutionalized during the time of the Ottoman Empire, the CSO moved to Ankara just after the Proclamation of the Republic and since then it has sustained its historical richness. 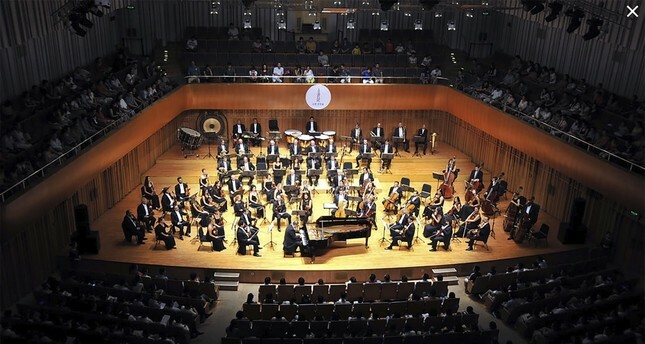 The Presidential Symphony Orchestra (CSO), which is among the world's most rooted art institutions, will salute music lovers with more than 30 concerts at the second half of the season 2018-19. In addition to the pieces which will make world premiers this year, the program also offers pieces to be performed for the first time in Ankara. Conductor and General Director of CSO, Rengim Gökmen spoke to Anadolu Agency (AA) sharing his thoughts on the second half of the new season. Stating that they welcomed the second half of the 2018-19 art season with a grand concert performed at the Presidential Complex, Gökmen said, "as 2018 was announced as 'the Year of Troy,' we performed a special concert for art lovers." Institutionalized during the time of Ottoman Empire, the CSO moved to Ankara just after the Proclamation of the Republic and since then it has sustained its historical richness. Gökmen pointed out that he took great responsibility in working for a historic institution for art and said, "The orchestra attaches great importance to the works of Turkish composers. In addition, I hope that this season will be more fruitful in terms of familiarizing our people with universal masterpieces, ageless works and performing the rarely presented vocalized pieces." "We will have concerts with interesting themes in 2019 and all their content will be fruitful. This season we will realize the world premieres of some pieces in addition to the ones which will be performed for the first time in Ankara," Gökmen added. Rengim Gökmen noted they will organize special concerts for the national holidays as they hold every year. At this year's March 18 Çanakkale Victory and Martyrs' Day Special Concert, which will be conducted by maestro Burak Tüzün, "Gallipoli 57th Regiment Symphony" by Can Atilla will be on the stage for its Ankara premier, Gökmen noted and added that they expect a huge turnout for the concerts on March 14 and 15. "We study on a repertoire for the concerts held within the context of special days every year. At the Commemoration of Atatürk Youth and Sports Day Concert planned to be held on May 17, the orchestra will stage the premier performance of "Sonsuzluğa Atılan Adım" ("The Step into Eternity") by conductor Tolga Taviş. It is really meaningful for us to realize the premier of a work at special concerts," said Gökmen. At the March 8 International Women's Day Special Concert, which will be conducted by maestro Natalia Ponomarchuk, violin virtuoso Elif Ece Cansever will take the stage. The orchestra will also perform a special concert on April 23 National Sovereignty and Children's Day. Gökmen stressed that he is welcoming the recent increase in the interest for classical music and added, "CSO does not practice favoritism toward any kind of music, but pays regard for development, quality and expertise. While studying the pieces we placed into the repertoire for the first time, we look for the ways of performing it and for the ways of enriching the piece. Hence, CSO acts as a pioneer institution for music in Turkey." Gökmen concluded by stating that CSO conducts its works without sacrificing quality of performance and is pleased about being appreciated by the art environment.